Because, folks, it's axiomatic: when you raise taxes on an activity, you reduce that activity. People start doing that activity less. In this case: working. When you reduce taxes on an activity, then that activity increases. When you reduce taxes on income, people start working harder to earn more. Governor Paterson needs to cut taxes on people. He needs to spur investment. He needs to get people going and working. It's just the exact opposite. Governor Paterson is like most other liberal Democrats: zero-sum game. The economy is a pie. It never grows. Somebody gets their slice; somebody gets their slice. ..... I would love to tell this story. I don't think I should. I don't think I should get personal, but I would love to tell my tax audit story of New York State and New York City since 1997. It happens every year, but that's not the point. I have to prove 14 different ways where I am every day of the year. I have to prove 14 different ways, 'cause I pay New York state and city tax on a per diem. When I am there working I pay whatever, you know, my rate is based on income for that day in New York. And I try to go as little as possible. If it weren't for hurricanes down here, I would never go up there. New York is the escape valve in case hurricanes are showing up in our area, because of the loss of electricity. So I'll tell you what I'm going to do. I'm going to look for an alternative studio somewhere outside New York, perhaps Texas -- another no-income-tax state -- and I'm going to get the hell over there, when a hurricane starts coming our way, 'cause I told Mayor Bloomberg: I'll be the first to lead the way. You know, this is just... I'll sell my apartment. I'll sell my condominium. I'm going to get out of there totally, 'cause this is just absurd, and it's ridiculous -- and it isn't going to work. It's punishing the achievers for the mistakes and the lack of discipline on the part of a bunch of corrupt politicians that have run that city and state into the ground for I don't know how many years -- and I, for one, am not going to take the blame for it. This math is very rough, but based on Limbaugh's announced deal with Clear Channel and his roughly 15 business days there a year, his allocated income to New York would, if it all has to be considered, at least $1.5 million. The state's tax take on that at 9% would be about $135,000; the city would also whatever income tax revenue it thought it would collect. If Limbaugh chooses to move what remains of his New York operations elsewhere, the city and state will lose out on taxes from those workers too, at least as long as it takes for them to find other work. And who knows? They might vote with their feet too. Limbaugh's example is a microcosm of media failure, in this sense -- almost no one in the media ever questions whether rosy forecasts of the revenue that is supposed to come in from tax and fee increases will ever materialize. They usually don't. Michigan's 2008 tax-increase story is just the latest example. Of course, press reports, like this alleged Associated Press analysis found at the Chicago Tribune, blame it all on the economy. Sorry folks, that's not all of it. 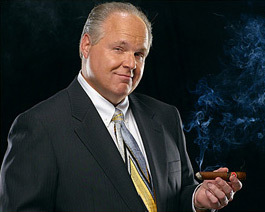 I would invite El Rushbo to Ohio, but he's looking for a no-income tax state. Then again, it seems that Ohio Governor T-Shirt Ted Strickland is planning to do the same thing by moving to no-income-tax Florida when his time is up -- hopefully sooner rather than later.